The Census Bureau reported this week that the gender wage gap between full-time, year-round working men and women in 2013 remained virtually unchanged, with women earning 78 percent of what men earn. The 1 percent increase from 2012 is not statistically significant, and there has been no real movement in the gender wage gap since 2007. While working women have made great strides since 1967, when they earned only 58 percent of what men earned for full-time, year-round work, there is still a long way to go before true pay equity is achieved. This means that, although women are the primary, sole, or co-breadwinners in nearly two-thirds of families, dollar for dollar they continue to earn, on average, 22 percent less than their male counterparts, with Latinas and African American women experiencing the sharpest pay disparities compared to white men. There are a number of factors that contribute to the pay gap, including where women work, differences in hours worked, and education differences. But there is also a portion of the pay gap that is unexplained; researchers have estimated that as much as 10 percent to 40 percent of the gender wage gap cannot be explained even when taking into account gendered differences between the occupations, educations, and work histories of men and women. Closing the gap will require multifaceted solutions that together help ensure that the work women perform is valued fairly, that women are not penalized unfairly for their caregiving responsibilities, and that there is greater transparency in workplace pay practices. Here are seven steps we can take that could make a difference. Women make up a disproportionate share of low-wage workers, and estimates show that differences between women’s and men’s occupations could account for nearly one-half of the gender wage gap. Raising the minimum wage will help hardworking women better support their families. While nearly two-thirds of mothers are breadwinners or co-breadwinners for their families, women made up approximately two-thirds of all minimum-wage workers in 2012. The current federal minimum wage is $7.25 per hour, which means someone working full time, year round earns only $15,080 a year. That is below the poverty threshold for any family with children and not far above the poverty line for a single person. Increasing the federal minimum wage to $10.10 an hour would boost wages for about 15 million women and help close the gender wage gap. The gender wage gap is particularly prominent among tipped workers. The federal tipped minimum wage, which hasn’t been changed since 1991, only pays workers $2.13 per hour. 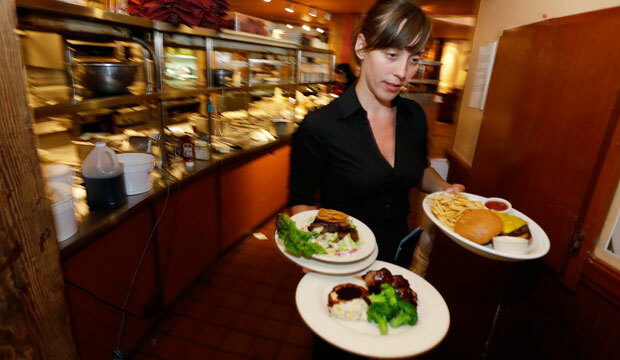 According to the Economic Policy Institute, women make up two-thirds of tipped workers and are 70 percent of food servers and bartenders, occupations that comprise more than half of the tipped workforce. Tipped workers have a higher poverty rate than non-tipped workers, and 46 percent rely on government assistance to make ends meet. As the burden of tipped-wage poverty falls primarily on women and their families, raising the tipped minimum wage could make a real difference in decreasing the gender pay gap. Recent proposals advocate raising the tipped minimum wage to 70 percent of the minimum wage to ensure that the majority of a worker’s income is coming from his or her employer, instead of from tips. Women, especially women of color, are more likely to work in low-wage jobs and often have rigid, unpredictable schedules that can change with little notice, making it difficult for working parents—especially mothers—to anticipate their schedules and arrange for child care. These workers risk losing their job because they lack the flexibility to alter their schedules when they need to take their child to the dentist or pick up a sick child from school—tasks that are more likely to fall to mothers than fathers. Legislation has been passed in Vermont and San Francisco in the past year that provides workers with a “right to request,” allowing them to ask for greater flexibility or scheduling predictability from their employer without jeopardizing their job. Being able to keep a job is essential to closing the gender pay gap. When women are not able to discuss their salaries with their colleagues, they often cannot tell when they are making less than their male colleagues for doing the same job. The Paycheck Fairness Act would reduce pay secrecy, give women better tools to address pay discrimination, and make it more difficult for companies to pay male workers more than female workers—an important tool in combatting the gender wage gap. Each day, 11 million children spend time in the care of someone other than a parent. Among children under age 6, 65 percent either live with only a single parent who works or two parents who both work. For parents of young children, particularly those who are low-income, the lack of affordable, high-quality early childhood programs can prevent working parents from ensuring that their families are cared for while they fulfill the demands of their jobs and can inhibit their long-term success. Furthermore, child care costed more than median rent in every state in 2012, yet access to reliable child care is a requirement for working parents to maintain employment. Legislation such as the proposed Strong Start for America’s Children Act invests in high-quality and sustainable early learning environments for young children, working families, and the future of our country. Investing in affordable, high-quality child care creates long-lasting structures that support both working parents and children, increasing women’s ability to keep a job, excel in the workforce, and lower the gender wage gap. Everyone gets sick, but not everyone has time to get better. Almost 40 million U.S. workers, or about 40 percent of the private-sector workforce, do not have access to any paid sick days. For part-time workers, that figure climbs to 73 percent. As a result, these employees often must go to work sick, send their sick children to school, or leave their sick children at home alone because they fear they will be reprimanded or fired for missing work. A 2012 poll found that one-third of parents of young children report that they will experience negative job consequences if they have to miss work to stay home with a sick child. Paid sick days would help close the gender wage gap by ensuring that women, who most often care for sick family members, would not lose pay or their jobs just because they or their child fell ill. If employees must take unpaid leave from work when they fall ill, the loss of wages can take a toll. The strain is most acutely felt by low-income workers, most of whom are women; these workers are also the least likely group to have access to paid sick days. Eleven cities and two states across the country have recognized that this is bad for workers, bad for business, and bad for public health and have thus taken the lead in pushing legislation to guarantee paid sick days for workers through active campaigns and bills at the state and municipal levels. One such bill, the Healthy Families Act, would create a national standard by allowing workers to earn sick leave regardless of where they live. Because caregiving responsibilities most often fall to women and mothers, women are more likely to have to leave the paid labor force to provide family care. Furthermore, working women can be targeted for discrimination and denied job opportunities altogether because of negative stereotypes about their caregiving roles—stereotypes that men are less likely to face. According to estimates, slightly more than 10 percent of the gender wage gap is due to women spending less time in the labor force than men, often stemming from these disproportionate family care responsibilities. Access to paid leave has been proven to shorten time away from work and facilitate re-entry into the workforce and makes it more likely that women will return to work, return to their previous employer, and return with the same or higher wages, all of which can help to close the wage gap. And when gender-neutral paid family leave is offered, men are more likely to take it, which reduces stigma and caregiving penalties for workers. A national paid family and medical leave insurance program would provide wage replacement to working women—and men—when they must take time off to care for their families, bolstering families’ economic security. Paid leave would help reduce the gaps in work histories, which women are more likely to experience, that contribute to the wage gap and affect women’s opportunities to rise through the ranks. The United States is the only developed country that does not guarantee workers paid maternity leave after the birth or adoption of a child. In fact, only 12 percent of U.S. workers have access to paid family leave through their employers. California, New Jersey, and Rhode Island have implemented state-level paid family leave programs, and a national system such as that proposed in the Family and Medical Insurance Leave Act, or FAMILY Act, would help decrease the impact of the gender wage gap by supporting the vital work of caregivers and reinforcing families’ economic security. The seven actions outlined here offer concrete opportunities to reduce the gender wage gap in the United States. Together, they can help further the cultural and structural change that will bring us closer to making the 22 percent wage gap a thing of the past. Sarah Jane Glynn is the Associate Director for Women’s Economic Policy at the Center for American Progress. Milia Fisher is a Research Assistant with the Women’s Initiative at the Center. Emily Baxter is a Research Assistant for the Economic Policy team at the Center.